I signal when I’m riding my bike. No one wants to add unnecessary confusion when riding a bike where cars and traffic is concerned. I know I’ll come off second best in a bingle with anything bigger than another bike rider. If in doubt, ring, signal and/or nod so that you and other drivers know what to expect. But should you always signal? The SMH’s resident cycling blogger @MichaelOReily ponders the question in his latest ‘On Your Bike’ blog post. To signal or not to signal, that is the question he considers and he reckons that you’ve got to take into consideration a few points such as driver behaviour, injury risk, loss of braking and loss of control when weighing up whether to take your hands off the handlebars. Do you signal? Is it a two-finger salute when someone’s come a bit too close, a friendly wave or a serious turning hand? 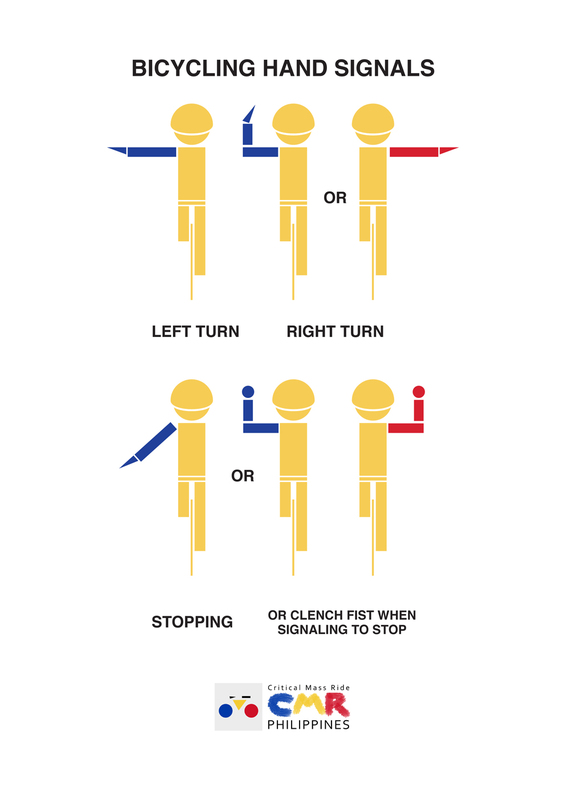 I guess as bike riders we’ve got to use some or all of these signals depending on the circumstances, eh? Anytime I’m near a road on my bike I wish there was a giant impermeable, unbreakable wall separating me and my bike and helmet and my no other protection from the cars and trucks and buses and their wheels, engines, heavy bodies and sometimes cyclist-hating drivers. It’s a fact that cycling, particularly in urban areas, is dangerous. The degree of danger varies depending on where you ride and the type of facilities that cyclists have available to them. On my commute to work I’m luck enough to travel on a shared pedestrian/cycle path the entire way except for two road crossing so it’s pretty safe and pedestrians and cyclists seem to co-exist very well for the most part. My only real gripe is speeding cyclists who seem to think it’s a section of the Tour de France not a shared path for commuting as well as recreational riding and walking. More on this in another post. One of the road crossings now has lights but the other is a bit scary as it’s near a roundabout and cars are going downhill so it’s easy for them to pick up speed towards where the cycleway meets the road. On the weekend, my husband and I cycle on this path as it goes out towards the beach or in towards the inner-city where it meets the new separated cycleways that are being built in Sydney city. I have been part of the University of New South Wales Safer Cycling Study. It aims to learn about when, where and why people cycle, and the risks, hazards, near misses and crashes that people experience while cycling. They reckon that there’s just not enough information about cyclists and these issues in NSW. Each couple of months I fill out a cycling diary detailing where I’ve ridden with distances and times along with details of any crashes or near misses I’ve been a part of. I’m happy to say I haven’t had to report any crashes, just a few near misses. Hopefully the study will be used to find out the safest places to ride and be used to lobby state governments and local council to put money into better riding facilities. Follow this link if you want to find out a bit more about it: Safer Cycling Study. If you’re interested in safe cycling, here are some links to websites with helpful info. Safe Cycling Australia grassroots campaign and lobby group. The Times has a Cities Fit for Cycling campaign promoting safe riding in London. Bicycle Safe has tips on staying safe. Citizens for Safe Cycling is a good example of community organisation promoting bike safety. 3 Feet Please is a campaign to promote a rule for safe cycling distances. I have always assumed the yellow, orange bright jackets and tops was a good way to be visible while reading. Although I have read on some bike sites that orange is actually more visible than yellow, despite the fact that most high-vis cycling gear is luminous yellow. I ride in both summer and winter with yellow high-vis tops or jackets. So I was intrigued to read this article on the BikeWise website about whether visible positioning or clothing has the greater impact on making a rider seen by pedestrians, cars and other traffic. I thought I’d publish some of the article on my blog as is raises some useful questions about the most sensible, and defensive, way to ride a bike. I guess it’s also a reminder about not getting complacent and assuming you’ll be spotted because you’ve got a blowing yellow jacket on while riding. The full article is at the BikeWise website and is Hi-Vis Clothing vs. Hi-Vis Road Positioning. This is because most drivers’ eyes are conditioned to look to the centre of the lane to see on-coming vehicles approaching. If you ride near the centre of the lane in such situations, you’re going to get seen. As an added benefit, you’re also going to see any cars approaching much sooner, because you have a better sightline of the intersection.